A new year and new initiatives. Here we are again, just a few weeks into the new year and not a lot of change. Donald Trump is America’s new president and some of his remarks are unbelievable. The stock market did not go haywire, as many predicted, on the contrary it rose. But ignoring politics, the year started with a few interesting acquisitions. The number of players tend to become fewer and bigger. First Atlas Copco acquired Erkat, a German manufacturer of rotating milling heads. At about the same time the company also said that it was planning to split the group into two companies. Second Husqvarna Construction Products acquired the Swedish manufacturer of industrial dust extraction and air cleaning equipment Pullman Ermator. Pullman Ermator is a strong player worldwide and during the last eight years built up a strong foothold in the US market with head office and assembly in Tampa, Florida. The Pullman Ermator product lines have been integrated in the Husqvarna product range and the branded products were displayed at the recent World of Concrete exhibition. However, it has been decided that the Pullman Ermator brand will continue as well for an undetermined time in the future, probably a wise decision as their products have a very strong name in the global market. But the question weather Pullman Ermator’s production facilities will remain in Smedjebacken, Sweden and Tampa, US, and not merged with Husqvarna’s different plants, remains unanswered. Time will tell. This year started quite strong with a number of important exhibitions. World of Concrete in Las Vegas was staged in January. PDi was exhibiting and there is a report of the show in this issue, which will also be distributed at the triennial Conexpo-Con/Agg show organised by AEM American Association of Equipment Manufacturers. This issue also features a Conexpo review with a list of selected exhibitors related to the product sectors PDi covers. At about the same time the Italian show Samoter will be held in Verona and will be attended by PDi and a report of the show will be published in the next issue. Also in the next issue will be a report on the German triennial concrete sawing and drilling show Bebosa, which takes place in Willingen. Bebosa is organised by the German Sawing and Drilling Association. That is about it for global shows for the year, all of them at the beginning of the year and quite an unbalance, but maybe it gives also time to work. We have to wait until 2018 for Intermat, Bauma China, Bauma India and others. 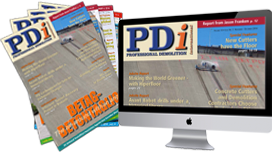 This year’s first issue of PDi is comprehensive and nearly as big as our Bauma show issue last year. This proves there is a strong focus on the US market and many international companies are trying their luck at Conexpo in Las Vegas. It is said that over 700 new exhibitors will attend the show this year and the line up is bigger then ever. The US construction market has picked up quite well during the last couple of years and that trend appears to continue, even though the US is reporting its biggest foreign debt ever. Let us hope that American contractors decide to visit the show instead of staying away working. From all of us in the PDi team we wish you a prosperous 2017 and please do not hesitate to tell us about your projects or new products during 2017.